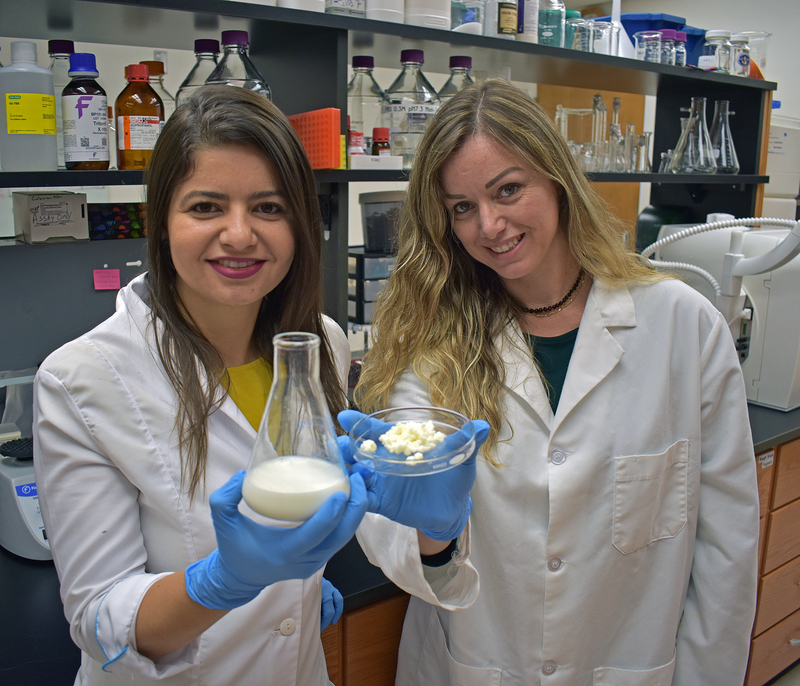 Mirian Silva-Cutini, left, a doctoral exchange student from the University of Vila Velha in Brazil currently studying at Auburn’s College of Veterinary Medicine, with Dr. Vincia Biancardi. They are displaying a sample of their research that suggests kefir may have a positive effect on blood pressure. Auburn University College of Veterinary Medicine researchers are being featured at a national meeting for their collaborative work with Brazilian colleagues that suggests drinking the fermented milk beverage, kefir, may have a positive effect on blood pressure by promoting communication between the gut and brain. Mirian Silva-Cutini, a doctoral exchange student from the University of Vila Velha in Brazil, and the first author of this work, presented the team’s findings at the American Physiological Society (APS) annual meeting at “Experimental Biology 2018” in San Diego. Silva-Cutini conducted her research at Auburn’s College of Veterinary Medicine under the direction of Dr. Vinicia Biancardi, an assistant professor in the Department of Anatomy, Physiology and Pharmacology. Kefir is a fermented probiotic milk beverage known to help maintain the balance of beneficial bacteria in the digestive system. Previous research has shown that an imbalance in the gut’s colony of bacteria (microbiota) may cause high blood pressure in some people. Similarly, probiotics—live bacteria supplements that are beneficial to the digestive system—have been found to lower blood pressure, but the mechanisms by which this occurs are unclear. After nine weeks of kefir supplementation, the treated rats had lower levels of endotoxins (toxic substances associated with disruption in the cells), lower blood pressure and improved intestinal permeability when compared with the untreated group. Healthy intestines allow some substances to pass through, but generally act as a barrier to keep out harmful bacteria and other potentially dangerous substances. In addition, kefir supplementation restored the natural balance of different bacteria in the gut and within the brain, it diminishes inflammation and an enzyme essential for normal nervous system function, suggesting that the nervous and digestive systems work together to reduce hypertension.